Terminal blocks for connecting thermocouple cables that can be mounted on DIN rail strip. The terminals are made of the appropriate thermocouple compensating materials for each thermocouple type. A pair of terminals are located at both the top and bottom and a thermocouple mini socket is located in the middle. 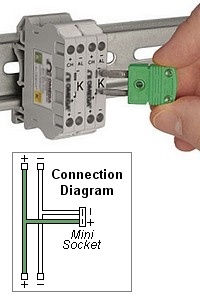 The mini sockets allows for easy fault-find or calibration of the connected thermocouple or instrument, depending on configuration, without un-wiring the cables. Note: Thermocouple mini plug is ordered seperately.